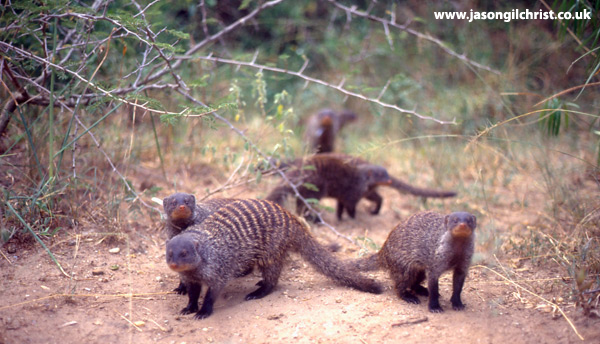 Banded mongooses (Mungos mungo) are small group-living mammals. Adults weigh 1-1.5kg. Groups vary from 9 to 28 individuals and pups. Females generally give birth synchronously, with up to ten giving birth in the same den. Litter size per female is 1-6, but usually 2-3. Most group members contribute to care of pups - with individuals escorting specific pups and providing food, shelter and protection. I am interested in who cares for the young in the communal litter - and why. My data collection involved capturing and marking mongooses, and monitoring reproduction, mortality, and behaviour in the field. My study site was Queen Elizabeth National Park, Uganda. The field research for this study was conducted whilst at the Department of Zoology, University of Cambridge. My primary research interests included a consideration of factors affecting reproductive success and pup care. 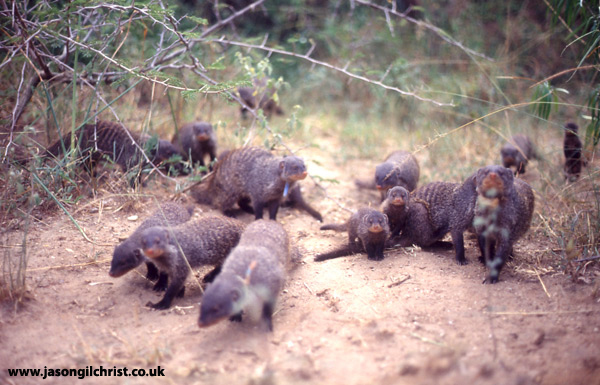 To view video of the mongooses and our field research work with BBC Vets in the Wild (away back in 1999): Vets in the Wild do the mongooses. I was a lot younger and more fashionably dressed back then. 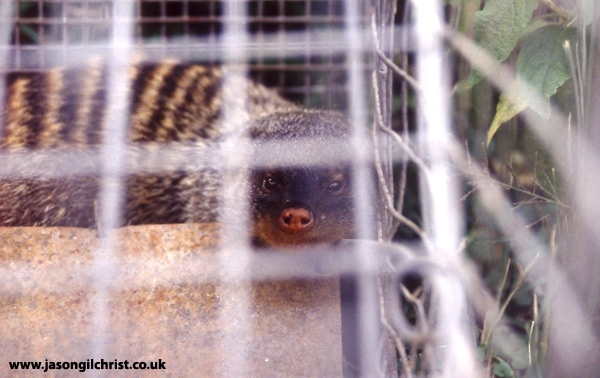 If you want to read more about banded mongooses, and see some more photos - click here. 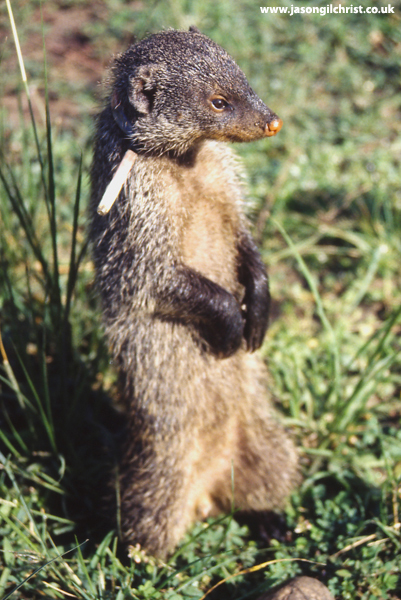 IUCN (International Union for Conservation of Nature and Natural Resources) Banded Mongoose Species Account: Mungos mungo. Popular science article: Civil war among the mongooses...and why it’s all about sexual success published in The Conversation. Latest scientific papers: Evidence of Oxidative Shielding of Offspring in a Wild Mammal. Click here to see list and links to: my scientific publications. 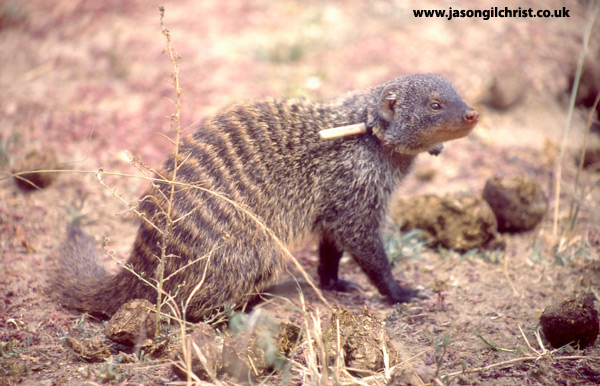 To visit the Banded Mongoose Research Project website, click here.